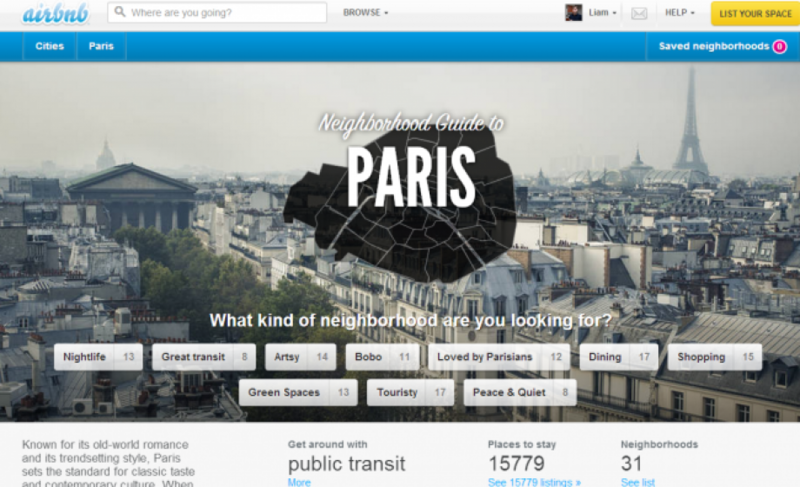 Airbnb contributes €185 Million to the Paris economy, so don't write-off the Sharing Economy just yet. Airbnb contributes €185 Million to the Paris economy, so don’t write-off the Sharing Economy just yet. Peer-to-peer marketplace Airbnb has released an economic study of its Airbnb hosts and guests in Paris, looking at key figures pertaining to guests & hosts. The study, which comes a few months after a similar study on Airbnb’s effect on the San Francisco economy, showed some pretty interesting stats, such as the €185 Million contributed to the Paris economy, much of which is new (as opposed to professional short-term rentals that existed before Airbnb). Comparing this to the $56M contributed to the San Francisco economy, it’s amazing to see that Airbnb makes more money in (and contributes more money to) Paris than SF, though their previous figures on the number of listings and their investment in Paris explains this. This lines up pretty well with the study’s final results: that Airbnb guests want to stay like locals. Airbnb touches a different group of travelers – arguably a relatively untapped market before Airbnb – and enables them to find the place they want to stay at. Some have been skeptical of the Sharing Economy in recent weeks – after all, it seems like there’s a peer-to-peer marketplace for almost anything these days – however, it is important to remember that, much like “social,” “gamification,” “SoLoMo” and many other Internet modules that have become standard practice across the web, there are places where P2P marketplaces will flourish, and places where it will drown. The key is not whether there are enough supply or demand (as most marketplaces require), but whether the relationship between the supplier and the customer was such previously in real life, or whether it had the potential to be but lacked the computer-driven connection. That is to say, you can’t force something like “food” to become peer-to-peer, unless people already have the habit of doing it on a small-scale, or they have a large desire to but have considered it ‘impossible’ previously. This is why we’ve seen things like ride-sharing (Blablacar) rise up – hitchhiking is a practice older than cars – as well as services like Drivy, OuiCar, and Buzzcar – because services like ZipCar got us into the habit of driving a car that wasn’t our own. So if you’re considering building a P2P marketplace, ask yourself whether what you’re doing falls into the above. And if you’re outside the sharing economy looking in, remember that, as pointed out in the Airbnb study, sharing isn’t for everyone. Some people want the cold, stale feel of a hotel room – and lucky for those people, there will always be an Ibis Style, Holiday Inn, Radisson Blu or Hotel W to keep you warm at night. Hmmm Im not sure about he math behind AirBnbs’ study. Things like “AirBNB users stay longer” and “AirBnB users spend more”. Figures do not seem to have been plotted against similar demographics. AirBnB users are maybe just more affluent, and more inclined to have longer vacations than the average tourist ? Only a rigorously scientific study could say, but obviously, with AirBnB itself at the helm, how could results have been in the disfavour ? Interesting article! The Sharing economy is truly blowing… By sharing more and more things, people realize better how much they can save in terms of money and how much they can win in terms of human relationships! Do you know Uolala? It’s a new social network that is now part of the “revolution” allowing to share good moments through meet ups in groups of your interest in Spain, France, Germany and the U.K… Another good way to get the most of your city with local people! The objective of every democracy is to get more of its people a better overall life quality. With money going directly to hands of the people rather than the big corporations which get tax concessions and park money in tax havens. The money in the hands of local people gets roll again and again leading to better tax earnings and lower social welfare expenditures.